Invented for NASA, this metalized gold reflective emergency rescue blanket proven in space missions to reflect back 80% of body heat utilizing super insulation. Used by the military, search and rescue, and relief agencies worldwide. 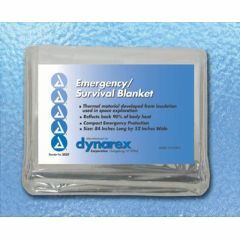 This emergency rescue blanket can help prevent hypothermia and post-traumatic syndrome. Small enough to fit in your shirt pocket, yet opens to a full 56"x 84" size and weighs only 2 oz. Windproof, waterproof and flexible to -60 degrees. Every outdoors person should carry one, every snow country car should be equipped with them, every wilderness cabin, ski lodge should be well stocked with them. As they say -- don't leave home without one! This item could save your life. Prejudged the product: What a surprise!! Emergency Preparedness. Outdoor Activities. Keep In The Trunk. I planned on using in my vehicle, but lost heat in my house. I thought it would be a good time to give the blanket a good trial, it was actually allowing me to use my body heat to remain warm. Light weight, and compact. Once you get it opened, it isn't the easiest thing to fold back up; especially if you are in a hurry. In cold climates, one or more should be in every car. If you get stuck on the road it can help you survive.